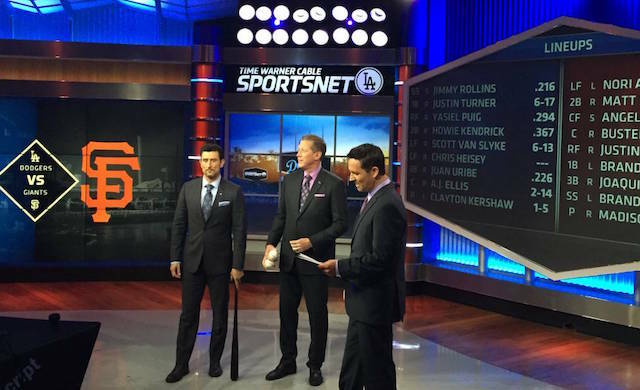 With the Los Angeles Dodgers on the road to face the San Francisco Giants, Time Warner Cable’s SportsNet LA studios in El Segundo, Calif., played host to representatives from multiple blogs Wednesday evening. Coordinated by Nadia Gonzalez, Communications Manager at TWC Sports, attendants from Dodger Blue (formerly Dodgers Nation), Lasorda’s Lair, Think Blue LA and True Blue LA were given a behind-the-scenes look at a night’s work before, during and after Dodgers games. 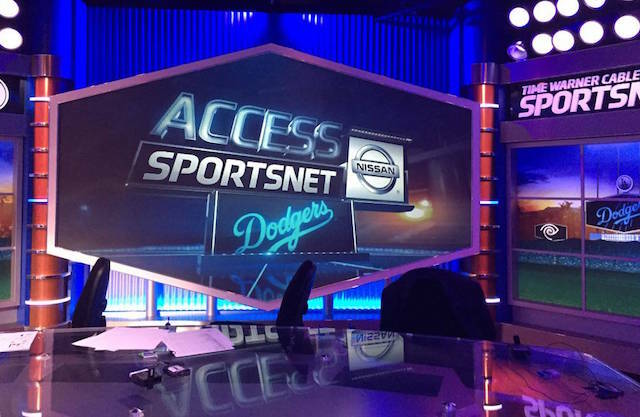 On the set of “Access: SportsNet Dodgers” that night were, host John Hartung, and analysts Orel Hershiser and Nomar Garciaparra. Prior to the show going live, the trio reviewed last minute notes and Hershisher said in jest to his co-workers that they act professional and give their best effort as visitors were on the set watching. While Hartung, Hershiser and Garciaparra were great on camera, their chemistry off it is what makes the show tick. After the 30-minute show concluded, Director of Studio Operations Peter Bothe offered insight into the building of the set, which is solely dedicated to the Dodgers — a key advantage when designing the studio, Bothe explained. “We’re never going to trick somebody when we’re showing them TV here into thinking that we’re at Dodger Stadium,” he said. In order to duplicate the infamous scoreboard from Dodger Stadium, Bothe explained the version inside the SportsNet LA studio relies on several mirrors and LED lights to project the image on the screen. From learning of specialized measures TWC has taken to leave as small as possible carbon footprint with their studio to various cameras needed in order to broadcast SportsNet LA programming, it was time to watch the game and enjoy tacos. Gonzalez and senior director of public relations Andrew Fegyveresi joined the bloggers in the boardroom and soon after, Hartung, Hershiser and Garciaparra sat with the group. With former players and inquiring bloggers in the same room, it naturally led to a discussion on the latest trends in baseball. Garciaparra is a strong advocate to swinging early in the count and reinforces the notion by instructing the bloggers to check his career stats on the first pitch of an at-bat — .365/	.370/.611 with 62 home runs, 85 doubles, 441 total hits and 215 RBIs in 1,236 plate appearances. Pitchers want to get ahead in the count, so why not swing early, on what may be the best pitch of the at-bat, he argues. Another hot topic, what “batted around” should be defined as was also discussed. 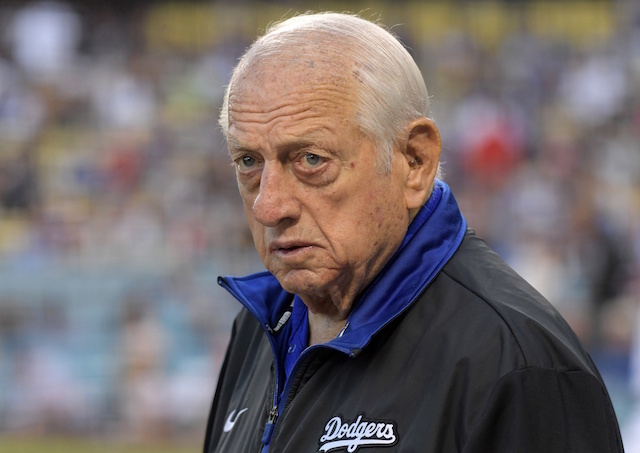 Vin Scully has previously said it’s 10, but Hershisher believes it’s when nine men come to plate — adding more confusion to the subject. In one of the more interesting and revealing demonstrations I have witnessed, Hershisher discussed some of the intricacies and difficulties of being a Major-League pitcher. The 1988 Cy Young Award-winner positioned two 8.5×11 papers side by side to demonstrate the width of home plate (17 inches). Hershisher then asked the on-lookers to imagine needing to perfectly locate one pitch after another with little room to spare. Garciaparra chimed in, explaining as a hitter, he’s capable of determining when a pitch is a mere centimeters off the plate or when he should swing at an inside pitch. 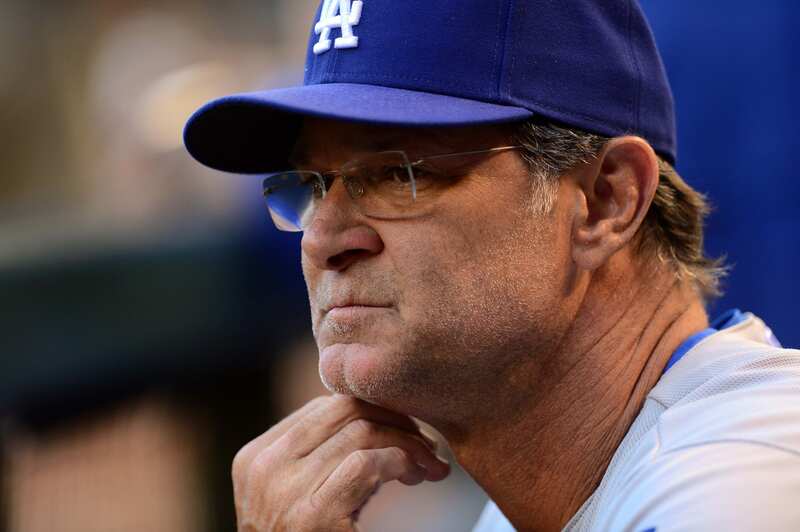 The on-air talent eventually needed to begin preparing for their postgame responsibilities and the Dodgers wound up losing 3-2 on a walk-off sacrifice fly in the ninth inning, which was the only negative of the evening.